Since Beelzebub Roger Goodell reinstated Sean Payton in January, Payton has repeatedly stated his intent to improve the Saints' running game in 2013. I know all the other elements of the game that that can help. It helps the quarterback’s production by helping him become more efficient and you become a better defense. It also helps you control games when you want to. There are times in games when you want to have control, and when you are able to rush the football you have a little bit better sense of that than if you are not able to. That is certainly one area that we have to be better at. We've had the "balance" discussion innumerable times, and I'm not going to rehash it here. Suffice it say, if Payton feels that committing to the running game is important, even in the face of the primacy of his passing attack, then we should trust him. Surely, it's derived from the Payton-era correlation of championship-caliber teams and efficient rushing attacks. Because last year represented the widest disparity in run/pass attempts since Payton arrived in New Orleans, it makes sense that optimizing the running game is one of the first tweaks Payton will make. Sean talked about that when he came back. When we had our first team meeting, he talked about that. He said we definitely need to get back to that ground game. There's going to be more focus this year on that ground game than any year. One of the more interesting, and encouraging, interpretations of Payton's renewed commitment comes from the Who Dat Social Club blog, who opined that Payton is taking the long view with the running game. More specifically, WDSC reasoned that, in order for the Saints to win the Super Bowl in the likely inclement conditions in New Jersey in early February, it's essential they possess a functional running game. [T]he real reason the Saints are going to concentrate on rushing this season is that Payton is concentrating on February. It’s not because he has no faith in his personnel; it’s because he understands the entire point of this exercise. ... And this brings us to Mark Ingram. I can't think of a player on the Saints' offense facing a more critical year than Ingram, and with the departure of Chris Ivory, it's exponentially more important that Ingram finally integrate himself into the Saints' offense. With his third pro season upcoming, Ingram has generated a few notable parallels to Reggie Bush during Bush's tenure with the Saints. For a stretch of Bush's career in New Orleans, most notably in the largely post-Deuce seasons of 2007 and 2008, Bush's presence on the field seemed to often obstruct the Saints' offense more than it facilitated it. This was anecdotally evidenced in the fact that the Saints, when Bush didn't play due to injury, had a higher winning percentage (65% vs. 61%) and scored more points per game (29.8 vs. 26.3). In much the same way, especially during 2012, it appeared that when Ingram was on the field, his presence detracted from the offense's effectiveness. Maybe this is just a result of my misinterpretation, or maybe it's because Ingram was miscast in 2012 solely as a power back, or more likely it was because of Sean Payton's absence. Any way you interpret it, though, Ingram hasn't effectively facilitated the Saints' offense in the manner Darren Sproles, Pierre Thomas, Chris Ivory, and a few others have over the years. Mostly, it feels like Ingram has been forced into the offense unnaturally. This was maybe less so the case in 2011, as Ingram seemed to be acclimating himself before injury derailed him for the season after ten games. Last year provided regression, or at least stagnation, and now the questions surrounding Ingram linger. It's difficult to judge any Saints' player by the clusterfuckish, sans-Payton standards of 2012, and with Ingram, that comprises 16 of his 26 professional games. This season, then, is of paramount importance. From my perspective, Ingram is equipped to handle a role similar to that of Pierre Thomas, and less like that of Chris Ivory or Mike Bell. Thomas, the quintessential runningback in the Payton offense, can do a little bit of everything, and can do it all in an above-average capacity. For the most part, Pierre Thomas is Sean Payton's answer to Bill Belichick's Kevin Faulk: versatile, reliable, capable, and tough. As Thomas collects wear on the tread, it's important for Ingram to capably mirror Thomas' role. Can he do it? Ingram has shown a nose for the endzone (10 touchdowns in 278 rushing attempts), and though he hasn't been involved in the passing game (17 receptions in 26 games), when given the rare opportunity, he appears perfectly capable of being an effective pass catcher out of the backfield. The reality, to date, is that Ingram, as a first round draft pick and Heisman trophy winner, has underperformed while battling injuries. 2013 feels like a make-or-break season for Ingram's long-term prospects with the Saints and the urgency is palpable. The hope, of course, is that Sean Payton will scheme to optimally deploy Ingram this year, reminiscent of Payton's decision to alter his utilization of Reggie Bush in 2009. Then, after two seasons of struggling with inconsistency and being less-than-effective, Bush embraced a new (more-limited) role from Payton and improved his yards per carry from a three-year average of ~3.7 to 5.6. Moreover, Bush stayed healthy all season. In the playoffs, he notched the longest rushing and punt return touchdowns in Saints' postseason history (to go along with his franchise record 88-yard touchdown reception against the Bears in the '06 NFCCG, notching an impressive hat trick of postseason records). Bush, while not necessarily living up to his perceived billing or the mountainous expectations heaped upon him, played a central role in the Saints' 2009 Super Bowl run. 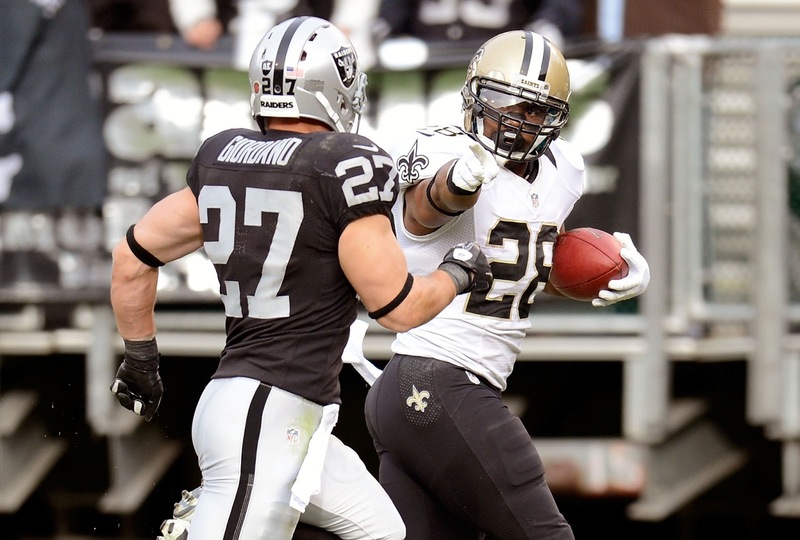 Now, perhaps, it's Mark Ingram's turn to do the same.